ASTON, PENNSYLVANIA, U.S.A., January 29, 2014: Extensive production-scale demonstration runs with a wide range of resins have shown that a new type of vacuum resin dryer introduced by Maguire Products, Inc. less than a year ago exhibits greater throughput than originally specified and achieves required dryness in just 35 minutes after a cold startup, the company announced today. 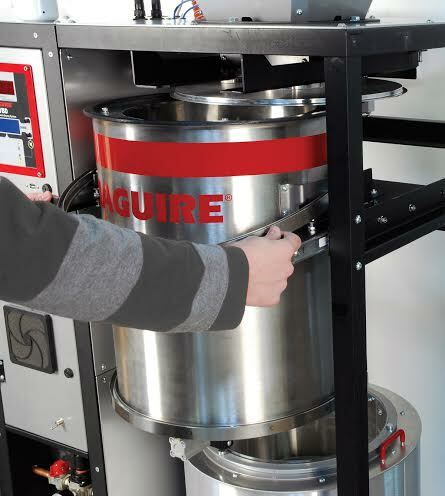 The Maguire® VBD™ 150 vacuum dryer, originally rated for a throughput of up to 150 lb. (68 kg) per hour, easily exceeds 200 lb. (90 kg) per hour with hygroscopic materials such as ABS, acrylic, nylon, polycarbonate, polyetherimide, and PBT, according to B. Patrick (Pat) Smith, Maguire vice president of marketing and sales. The ability of the dryer to deliver process-ready resin in just over half an hour is in sharp contrast with a conventional desiccant dryer, which takes up to four hours to bring resin from a cold startup to a condition of readiness for molding saleable product. Additional productivity enhancements are available with two features now available for the dryer: 1) an “EasySlide” mechanism that enables the vacuum vessel to slide out, giving ready access for cleanout; and 2) an optional hopper extension whose one cubic foot (0.028 m3) capacity extends the throughput of the dryer by 25%. The VBD vacuum dryer uses gravity to move material through three vertically arranged vessels, with the discharge of material from one vessel to the next controlled by slide-gate valves. From top to bottom, the vessels include a heating hopper that brings resin to a target temperature; a vacuum vessel in which vacuum reduces the boiling point of water, causing moisture within the pellets to volatilize and be forced out of the pellet into the low-pressure environment surrounding it; and a pressurized retention / take-away hopper that is continually purged by a membrane air dryer to maintain the target level of dryness until the material is discharged. This system eliminates most moving parts, in particular the three-station indexing carousel mechanism of the Maguire® LPD™ vacuum dryer introduced in 2000.. The new EasySlide feature involves the vacuum vessel, which slides out in the style of a drawer and is securely held in that position during cleaning. The feature gives access to the retention hopper as well as the vacuum vessel. Caption for Photo No. 1: VBD™ vacuum dryer is shown with hopper extension, which increases throughput by 25%. Components from top to bottom include: loader, hopper extension, heating hopper (with resin pellets visible inside), vacuum vessel, and retention / takeaway hopper.